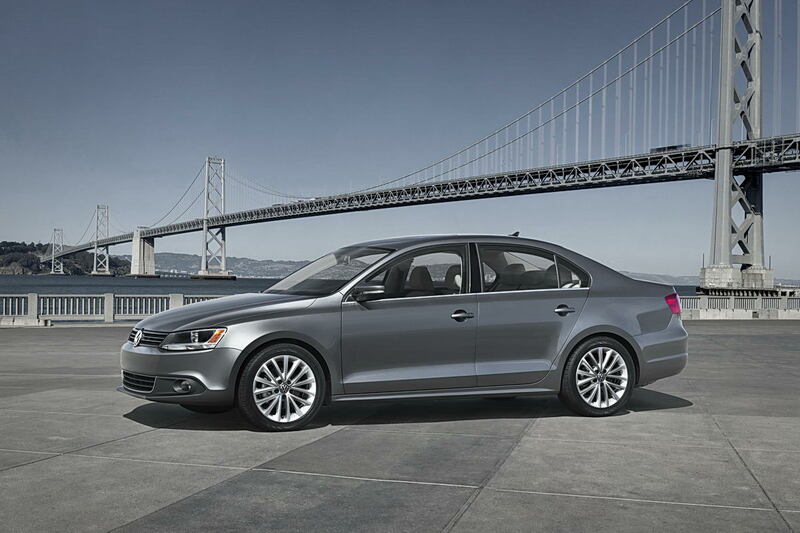 The all-new 2011 Volkswagen Jetta has been redesigned for the North American market. The 2011 Jetta is built on a new platform and will be larger than the current generation. Scheduled to be on sale at dealerships in fall of 2010 across the U.S., sixth generation (A6) Jetta pricing will start at $16,000 and buyers will have a choice of four engine options. A hybrid version of the Jetta will be available in 2012. The entry-level Jetta, with a 2-liter, 115-horsepower gas engine, goes on sale in October for around $16,000. The company is going after consumers who previously dismissed the model as too expensive. The list price of the lowest-priced 2010 Jetta is $17,735. The $16,000 Jetta is not a bare-bones model, but comes equipped with features like power windows and locks, keyless entry, air-conditioning and a CD player. Offered are four different engine options in the U.S. that include the 2.5-liter gas engine, a new 2-liter turbodiesel direct injection (TDI) that gets the car to 60 mph in a claimed 8.7 seconds. All Jettas come with a six-speed manual transmission, and the new 2-liter TDI and 2-liter TSI will also offer an optional six-speed DSG dual-clutch gearbox. In the U.S., S, SE, SEL and TDI versions of the Jetta will be available, as will a 2-liter GLI. The new Jetta resembles the NCC concept car that debuted at the North American International Auto Show in Detroit in January, with crisp shoulder lines replacing formerly flabby sheetmetal. With an overall length of 182.7 inches, the new Jetta is about 3.5 inches longer than its predecessor. Its wheelbase has also been stretched, which results in an extra 2.6 inches of rear legroom, at 38.1 inches. OMG….I test drove the 2011 Jetta TDI Highline today, WOW the torque in that machine is unreal! What a car!!! Mine is ordered and will Arrive Mid November! I feel like the 2011 Jetta is also a must have — it’s like getting an A4 at a fraction of the price. Can’t wait to test drive it. Who needs the BMW 1 series the 2011 Jetta is 1/2 the price , bigger ,better looking with better MPG.No wonder VW is going to push it over the top as worlds largest auto maker.Now they have a 16,000 dollar model to encroach on Corolla and Civic .Look at this car compare it to those cars and it’s a no brainer .Tailored beautiful as a custom suit compared to a mold injected plastic garbage can from Costco which is what the Corolla looks like.You can’t compare the handling also because that’s what V.W. does and know one likes Toyota’s Electromagnetic steering in comparison .The Civic is over the hill and the new Focus wont arrive for another year or more.Mean VW will have this market all to itself and the new Elantra is not competitor . I am in like sin! Jetta Wagon TDI with DSG. I’ve always been tempted but the old Jetta was unpretty.